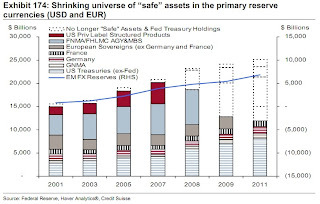 This figure shows that if one does not count French bonds as safe assets (a reasonable assumption), then about half of the safe assets disappeared by 2011. That is a tremendous drop and, as I see it, matters for two reasons. Before getting into them, though, it is worth briefly reviewing the structural and cyclical dimensions to the asset-shortage problem. The structural dimension is that global economic growth over the past few decades has outpaced the capacity of the world economy to produce truly safe assets. Ricardo Caballero, the author of this view, argues that it probably started with the collapse of Japaneses assets in the early 1990s, was exacerbated by emerging market crises throughout the 1990s, and got heightened by the rapid economic growth of the Asia in the early-to-mid 2000s. These developments along with the fact that most of the fast growing countries have lacked the capability to produce safe assets made the assets shortage a structural problem. Okay, so why does this safe asset shortage ultimately matter? The first reason is that many of these safe assets serve as transaction assets and thus either back or act as a medium of exchange. AAA-rated MBS or sovereigns have served as collateral for repurchase agreements, which Gary Gorton has shown were the equivalent of a deposit account for the shadow banking system. The disappearance of safe assets therefore means the disappearance of money for the shadow banking system. This creates an excess money demand problem for institutional investors and thus adversely affects nominal spending. The shortage of safe assets can also indirectly cause an excess money demand problem at the retail level if the problems in the shadow banking system spill over into the economy and cause deleveraging by commercial banks and households. All else equal, such retail level deleveraging causes bank assets like checking and money market deposits to fall relative to the demand for them. In other words, the broad money supply falls relative to the demand for it. The scarcity of safe assets matters, then, to the extent it creates an excess money demand problem that adversely affects nominal spending. To supply the world’s risk-free asset, the country at the heart of the international monetary system has to run a current account deficit. In doing so, it becomes more indebted to foreigners until the risk-free asset ceases to be risk-free. [G]iven the huge worldwide appetite for U.S. treasury debt (as reflected by absurdly low yields), this is the time to start accommodating this demand. Failure to do so at this time will only drive real rates lower. But running larger budget deficits over time may jeopardize the safe-asset status of U.S. treasury debt, the very thing currently driving the insatiable demand for it. The global economy thus faces a Triffin dilemma for the U.S. treasury, its go to safe asset. There is way out of these problems. Both the Fed and the ECB need to return aggregate nominal incomes in their regions to their pre-crisis trends and do so using a nominal GDP level target. Being a level target it would keep long-run inflation expectations anchored while still allowing for an aggressive monetary stimulus in the short-run (i.e. until the pre-crisis trends were reached). It would also stabilize nominal spending expectations and add more certainty to long-run forecasts. More importantly, it would spur a sharp recovery that would that would lower the demand for safe assets and increase the stock of safe assets. Both of these developments would in turn reduce the excess money demand problem and minimize the problems with the Triffin dilemma for U.S. treasury debt. Unfortunately, we are a long way from either central bank adopting nominal GDP level targets. David A. Yep. Me neither on the Triffin dilemma. Consider this post my attempt to blend the insights of New Monetarism with Market Monetarism. I remember some commentators making that point back in the early 2000s. It would have been interesting to have seen, though, what would have happened had the debt been paid down. Would structured finance made even more AAA-securities to compensate? Would interest rates been lower back then too? I found this Randall Wray insight darned interesting, investigated it a bit. I suggest this paper on institutional cash flows and the triffin dilemma in the us banking sector. Very relevant read on this topic. Great post, I am very interesting in the decline of safe assets. Would its be correct to read the structural element of this being related to the twenty year slide in real interest rates in nearly all of the developed world? I have also been describing something like the Triffen dilemma as "reserve currency Dutch disease.". The idea being that demand for reserve currency financial assets has a similar distortion effect on the economy as a resource boom,crowding out other tradable goods and pumping money into real estate and home goods. You got the Triffin idea from Pozsar, right? I just don't think this can be a real issue. 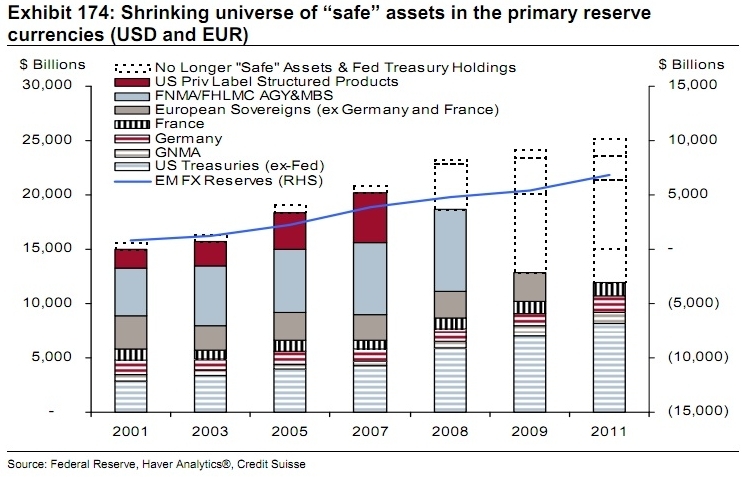 If the quantity of "safe assets" somehow collapses, then the prices of remaining "safe assets" will rise to meet the market's demand for safe collateral and stores of value. You can't have shortages in financial markets. Do you think you can? A lack of commitment gives rise to a demand for collateral. You are right that there is no shortage in the sense of supply equals demand. But this does not imply that the equilibrium price cannot be such that the asset in short supply trades at a liquidity premium. We can quibble as to how large one might expect this premium to be (as I believe you have before). But conceptually, this is what we are talking about. Your statement that "you can't have shortages in financial markets" is wrong--or at least, misses the point. Steve Roth and Bozhidar, thanks for the links. OGT, yes, I think the low rates around the world can be attributed in part to structural demand for safe assets. And I would add one more thing to the list of factors affecting the structural demand: demographics. The aging populations around the world are shifting their portfolios into fixed income as they retire and they too want safe assets. Your "reserve currency Dutch Disease" is clever and reminds of something Brad Sester said back when he was blogging: "The US has a comparative advantage is creating debt." Of course, he said that in jest, but along the lines of what we have been discussing there is some truth in it. What David Andolfatto said. I got the the Triffin idea from the above FT Alphaville post and ran with it. Christmas and all, I never had a chance to get back to this conversation. Perhaps the term "shortage" needs to be defined. David: "But this does not imply that the equilibrium price cannot be such that the asset in short supply trades at a liquidity premium." I don't disagree with that. But nevertheless, if some sort of liquidity premium develops in the market for certain safe and saleable assets, then that is the market adjusting prices so that no shortage exists. In other words, I agree that liquidity premiums have increased quite dramatically in some assets, but that doesn't equate to a shortage, just a shifting of prices to accommodate new desires. Why apply the term "shortage" at all? hmmm...in fiscal 2011, US treasuries attracted $3.04 for each dollar of the $2.135 trillion in notes and bonds sold, the most since the the first release of that data in 1992; would one consider that shortage, or just excessive demand?